Fairfax County police have released photos of jewelry that was stolen from a Muslim family's home after it was vandalized with hateful graffiti. Police say the family's apartment, located in the Huntington section of Fairfax County, Virginia, was burglarized and vandalized between March 24 and March 27. The apartment still was in shambles Tuesday afternoon. Their ornate Quran was torn up, and artwork with religious calligraphy was bent and thrown to the ground. The words "F--- Muslims" were scrawled on one of the apartment's walls. The family members' green cards were taken, along with more than $25,000 worth of gold they received as wedding gifts, as is common among many Muslim families. "I was crying. It was bad. It was bad," one of the victims, Mahrukh, said. She and her husband, Shoaib, asked that News4 use only their first names, for their safety. 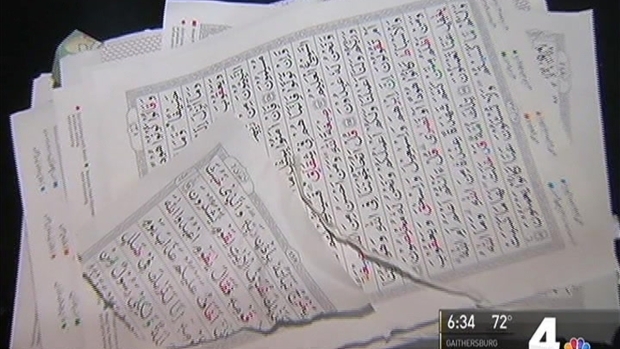 Photos show the hateful graffiti and torn-up Quran pages alongside children's toys. On Thursday, police released photos of the several pieces of ornate jewelry that was stolen. Someone broke into a Muslim family's home in Northern Virginia and scrawled "F--- Muslims" on a wall. News4 blurred the obscenity. "We were in complete shock. It's a dream. We're just going to open our eyes and it's all going to go away," Mahrukh continued. "Especially when we saw that written on the wall and the Quran torn to pieces on the floor, and my painting just torn apart and on the floor, that was just shocking." Police believe the burglar or burglars entered through a patio door. The door lock was broken inside the frame. They are investigating the crime as a burglary and a bias incident. Mahrukh and Shoaib said they believe who ever damaged their home meant to burglarize it and then vandalized it once they realized they were in a Muslim home. A Muslim couple in Northern Virginia say they returned home to find "F--- Muslims" scrawled on a wall and their Quran destroyed. News4's Julie Carey reports. Shoaib addressed why he chose to speak publicly about the crime. "We wanted to get the word out there that this cannot be normalized. This cannot become a normal thing," he said. Anyone with information that can help police is asked to call 703-691-2131.